OUT of 33 wards in Lusaka, only six PF women were elected to local government seats in the just ended general elections. The women that were elected and sworn-in last week in the Lusaka council chambers have pledged to defend the republican Constitution in the execution of their duties. Among them was Nkoloma ward one councillor and daughter of the Republican President Edgar Lungu, Tasila Lungu for Chawama , Bupe Mulenga Munkolo ward 12, Kanyama , Annie Chinyanta, Matero ward 28 Matero, Dorcas Moyo Chainda ward 29, Munali and Chitangala Chilando, Roma ward 17 and Ruth Phiri Chaisa ward 20 both from Mandevu constituency. 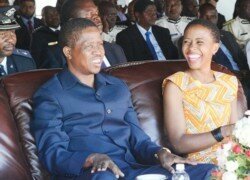 And Ms Lungu said she would ensure that many youths and women were empowered and also tackle the issue of security including the roads in the ward. Ms Mulenga said she would scout out for land for the construction of a hospital in Munkolo ward because Linda compound had no health post and patients walked long distances to Kanyama and other surrounding health posts to seek medical services. Ms Chilando said she would ensure that people of Roma ward had access to clean drinking water and other basic needs such as garbage collection and sanitary conditions. Meanwhile, Ms Phiri added that sanitary conditions were a major challenge coupled with security, but promised to improve the people’s living standards in Ngwerere ward by improving their status. Ms Moyo of Chainda ward pledged to upgrade the drainages and roads in her area by engaging stakeholders in the area on various initiatives aimed at improving living conditions of the people.